Improving your ED patient experience is the single most effective way to increase patient satisfaction scores throughout your entire hospital. When Charles Bukowski wrote, “What matters most is how well you walk through the fire,” he unknowingly captured the biggest challenge to emergency departments (EDs) in the 21st century: providing high-quality, compassionate care amid increasing demand and diminishing capacity. For our healthcare clients, the ED admits 60 to 80 percent of their inpatient population making it the largest introduction to their healthcare system and the biggest opportunity to create life-long, loyal customers. Getting the ED patient experience right is paramount to improving overall patient satisfaction in your hospital. The answer to improving your ED’s decline is as easy as listening to feedback. Patients spanning across generations and cultures want the same thing: effective and compassionate healthcare services. Today, patients agree that the most critical factors in their satisfaction revolve around communication. As patients have come to recognize themselves as active participants in their medical treatment they seek a humanized healthcare experience in which they’re treated as a person, not an illness. The sharp rise in demand for EDs is an unprecedented global trend and as EDs evolve to adapt, so must potential solutions. The new formula for success couples compassionate care with high-touch customer service. A large medical system with nationally renowned doctors and excellent clinical outcomes reached out to us regarding their ED’s declining satisfaction rates. BEST implemented a high-touch, customer-service focused patient experience program that manages the non-clinical needs and wants of patients, their families and guests. This effectively removes barriers that reduce clinical productivity and the ED’s overall capacity. Our client’s quality of care rating improved by 29 percent within the first 15 months of program implementation. Consequently, our client’s staff is a lot happier too! We had our suspicions that the clinical team was hesitant to partner with us at first. We don’t blame them; it’s a fast-paced, high-stress environment. As it turns out, the BEST concierges did wonders for their medical-mojo! Happier patients = happier medical teams and vice versa, happier medical teams = happier patients. Because EDs are one of the most overtaxed systems in healthcare they struggle with patient satisfaction, despite compassionate staff and excellent care. Increasing customer service — and therefore communication— to compensate for the ED’s highly-charged, somewhat chaotic environment sets your entire hospital up for success. Despite overwhelming evidence that people-based communication is essential to patient satisfaction, healthcare systems continually invest in technology and upgraded amenities to circumvent hiring actual staff to increase experience scores. While tech and amenities have merit, if patients’ basic needs and wants aren’t being met, they’re simply window-dressings. As a matter of fact, patients continually rate tech and amenity investments as targeting the least significant factors related to patient experience. Hospital systems go for technology and amenities because they’re often the most cost-effective and easily scalable “solution.” But if it doesn’t move the meter on patient satisfaction, how cost-effective is it? These approaches target factors that aren’t nearly as significant to patient experience as relationships and communication are. What Story is Your Hospital Telling? Experience is a fundamental driver of the stories people tell about your healthcare organization and these stories matter above all because they’re impacting your hospital’s bottom line. 72% of patients rated recommendations from family and friends as the most crucial factor in making healthcare choices. If your hospital is in the business of creating great success stories for your patients to tell the world, customer service is going to play a significant role. Research, in addition to our client’s ED outcomes, suggests that the most efficient and cost-effective way for healthcare systems to improve HCAHPS and other patient satisfaction metrics is by focusing on delivering compassionate care while adding a high-touch customer service program to manage the non-clinical needs of patients, their families and guests. 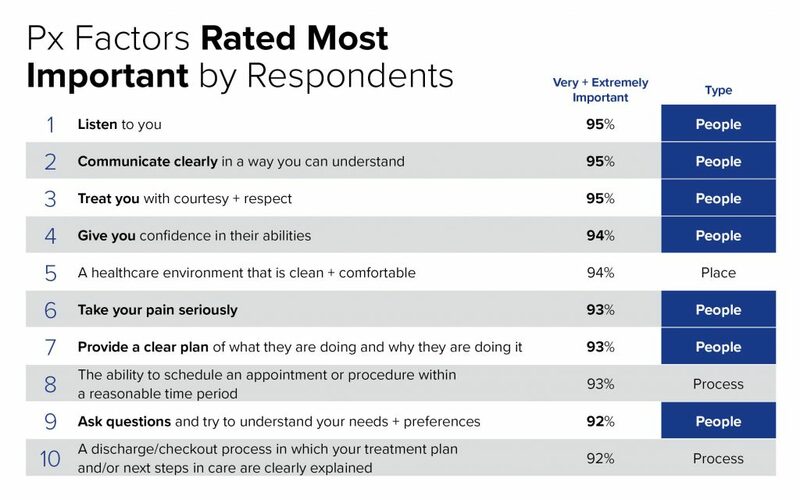 *Data/Charts from The Beryl Institute’s 2018 Consumer Study on Patient Experience.